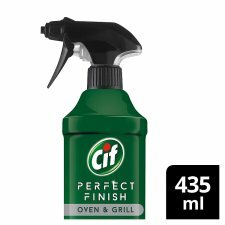 Restore the sparkle of your ceramic and stainless steel oven from the inside out with the new kitchen cleaner : Cif Perfect Finish Oven & Grill Spray. The specialist oven cleaner spray has been scientifically formulated to attack burnt on grease delivering 100% tough grease removal. Its powerful formula with degreasing agents will cut through even the most difficult grease stains from the oven, grill and hob, leaving your surfaces at their beautiful best. Also try Cif Limescale Remover, Cif Mould Remover and Cif Stainless Steel from the Perfect Finish specialist range for all your tough cleaning jobs. Apply directly to cold surfaces until completely covered. Leave to work for up to 30 minutes depending on the toughness of the soil. Rinse. Keep in a cool place and store upright. Also suitable for the barbecue grill. Do not use on oven trim, pilot light or heating and fan elements. Do not use on self-cleaning ovens. In case of any doubt, refer to oven manufacturer instructions. Do not use on: aluminium, copper, brass, marble, painted wood or appliance lettering.